I hope to nurture this beautiful piece of land and its wildlife in the spirit of Aldo Leopold’s “Land Ethic,” recognizing Leopold’s wisdom that we can never possess land, rather we must respect and love it. brazosrivercanyonlands.com tells a story about a place of surprising beauty in West Texas, filled with canyons and tablelands carved out by the Double Mountain Fork of the Brazos River. Off the edge of the Texas High Plains, below the caprock, the canyons lie folded and deeply tucked away and the tablelands rise as mountain landmarks, all in the ranch lands of Kent, Scurry, Fisher and Stonewall counties. We call this area the Brazos River Canyonlands. I was born and raised in the Brazos River Canyonlands in Fisher County. My maternal great grandparents moved to Fisher County at least as early as 1891 and my grandparents soon followed. The men were teamsters initially, using horses and mules to build roads and to dig dirt, clay bottomed tanks. They built tanks and creeks or ravines to collect and hold water for the horses and longhorn cattle herded up the Brazos. My Mother and her brothers and sisters were born and raised in Fisher County. One uncle, Hue, became a rancher whose place was located where Little Rough Creek enters the Double Mountain Fork of the Brazos River near the county lines of Fisher, Kent and Scurry counties. Uncle Hue and Aunt Sally had no children and, as a boy, I enjoyed and loved them, their attention and their wild ranch. For a few years before my Uncle Hue died of a heart attack on his ranch, working his cattle, I stayed at the ranch with them whenever I could. I may have worked some but mostly I just tagged along with funny, hardworking young men and women listening to their stories and playing in the wild outdoors with dogs and horses and chasing wildlife. I never was enamored with the cows like a real cowboy, but I did love riding horses, swimming and fishing in the river “holes,” hunting raccoons with dogs, dodging rattlesnakes and trapping varmints (too many skunks and never catching a coyote). For a year or so I dreamed of being a professional trapper, studying the Sears catalogue traps section, running through my hands the cool, steel traps with their hair triggers in the hardware store, saving to buy my own “line” of traps, learning from my uncle and his friends how to lay the traps, spread the scent, use baits, circle a dead calf with a ring of coyote traps, and remove my foot prints with limbs from cedar trees as brooms. I left West Texas in 1957 to go to college and then on to the city. In 2007, I bought a ranch near my Uncle Hue’s old place. About two sections in size, the ranch is identified by two large canyons. 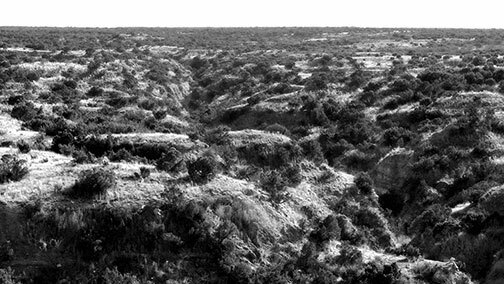 Impossible Canyon originates on the ranch and forms the West property line. Goldstens Canyon also originates on the ranch. These two major canyons create a web of ravines and springs through the range lands and the two canyons run a few miles into the Double Mountain Fork of the Brazos River. I call the ranch Impossible Canyon Ranch. This part of West Texas maintains the grandeur and sense of outdoor adventure it held for me me over fifty years ago. With fewer people and cattle now than then and with important conservation efforts, the wildlife has returned with startling abundance. 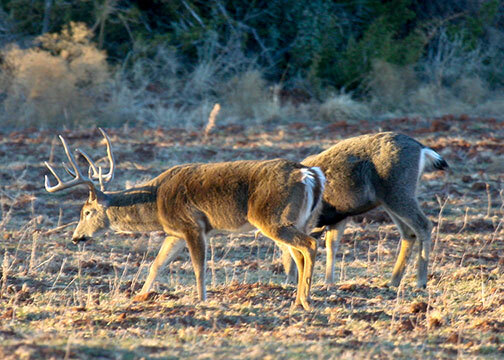 The area is one of very few places to support significant populations of large Whitetail and Mule Deer. Turkey, quail and dove thrive. Feral hogs, resembling the baby buffalos which once roamed this country, add to the fun and fare. I have no cattle on the ranch nor plans for them, nor do I plan finally to become a trapper. I hope to nurture this beautiful piece of land and its wildlife in the spirit of Aldo Leopold’s “Land Ethic,” recognizing Leopold’s wisdom that we can never possess land, rather we must respect and love it. This website reflects my ambitious desire to create a West Texas version of Aldo Leopold’s Sand County Almanac (1949). 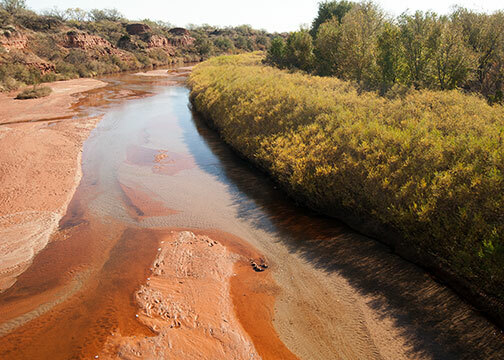 Please join me by sending your comments, stories and photographs of the Brazos River Canyonlands. This web page was last modified on August 23, 2016.